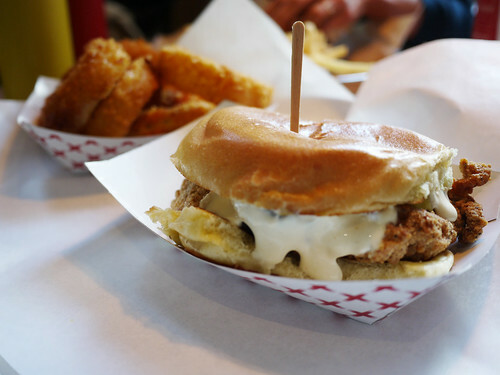 In brief: A winning combo in the crispy chicken fillet sandwich and sloppy joe. The only trouble with the crispy chicken/ sloppy joe combo at Schnipper's is the eternal marmite vs. jam dilemma that M. and I had every morning we lived together on Forbes Ave. It didn't matter if you started savory or sweet, it was impossible to decide which to end on. In the winter we would huddled near the toaster oven, usually wrapped in a scarf and woolen hat, waiting for the toaster to pop. Each new piece we cut into half and then half again, never able to decide what to end with.